Camellias suffering from Sooty Mould may develop a black or green coating on their leaves. The green is caused by a covering of algae, while the black is sooty mould fungus. These generally do not harm the plant, but they can cause a decrease in vigour. To prevent algae forming on the leaves, feed regularly to improve growth, and prune out congested growth to reduce humid, stagnant conditions. Sooty mould grows on the sticky honeydew is excreted by pests such as scale insect, so these should be controlled first. before wiping away the sooty mould with a damp cloth. In heavy infestations a strong spray of soapy water (one teaspoon of mild washing up liquid per gallon of clean water) can be used to dislodge the mould growth. 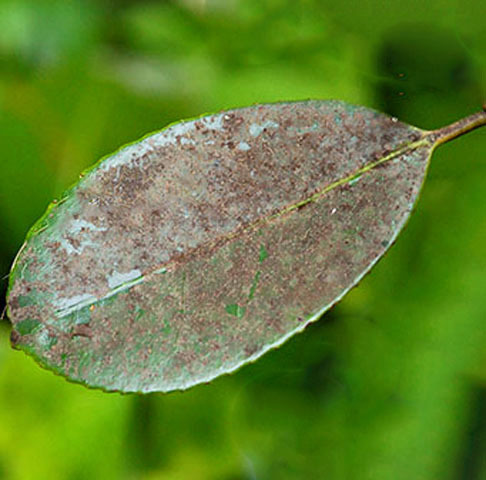 With light infestations, cleaning the leaves with a cloth, or indeed, removing the leaves might be the better option.